Pokey has been on loan to George of SHARC who took the robot to the Thompson Robotics Expo in Loveland last weekend. 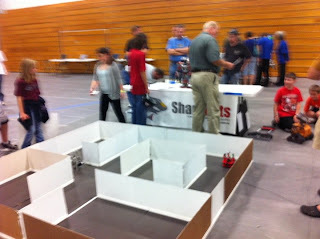 The expo featured two robotics competitions. Of the 60 teams from the Thompson School District in Loveland, 22 teams competed to go to the VEX World Championship in Orlando, Florida while another 38 teams competed in a FIRST Lego League qualifier. The event also showcased exhibits from the Denver Museum of Nature and Science, a robot mannequin simulator from Banner Health, MATE underwater robots, a robotic dog from Road Narrows, an Antartica underwater robot simulator, a demonstration of Thompson Valley's and Loveland High's FIRST Robotics Challenge robots, BEST robotics competition demo, and of course the SHARC firefighting demo with several robots, including Pokey. George sent me an email a few days before the expo. With the motivation of an event deadline I got busy, reassembled the robot and thrashed on the code to add a number of enhancements. Though still without a working fan motor driver, and lacking any kind of maze navigation code (bluetooth remote control only) Pokey's working better than ever and I'm told he performed well for the kids. Cool.